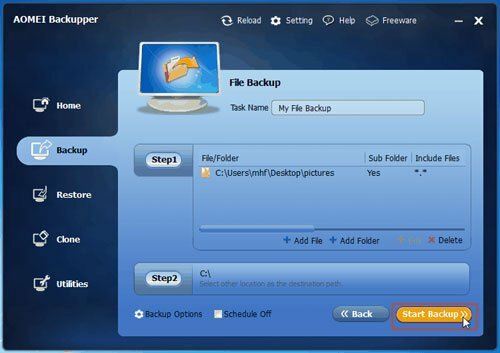 AOMEI Backupper provides a File Backup feature to backup files and folders by copying those files from a source folder to a destination folder. This feature is very useful when you only want to backup an individual files instead of a full backup. The most used and most popular backup methods are System Backup, Partition Backup and Disk Backup. 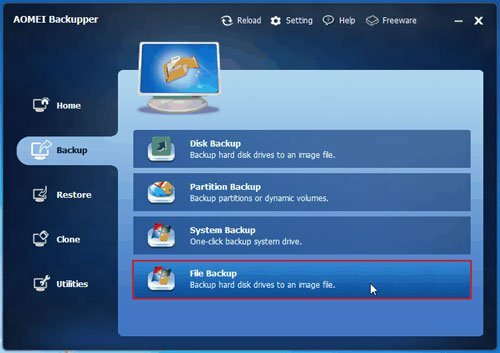 These three backup modes can provide user useful and effective ways to create full backup for their partition, system or even the entire disk. There is no doubt that full backup is the powerful and efficient way to enhance data security, however, it still has its deficiency in storage space and processing time consuming. What should you do if you just need to backup a specific file or folder? Partition Backup and Disk Backup will absolutely backup the files or folder you want, but it will also backup those files and folders you don’t need. In order to solve this problem, AOMEI Backupper provides a new feature to deal with those kinds of tasks -- that is File Backup. File Backup refers to backup a specified file or folder to prevent data loss. For instance, you can create backups for your family pictures, favorite music or other user files. File Backup is more convenient than full backup, because it can directly backup the needed files and avoid the undesired ones. This will not only save much of the operating time but also save storage space. If you haven’t formed a habit to create backup for your vital data regularly, then you are at the risk of losing those data permanently. Data which stored on your computer can be very fragile and vulnerable to attack. Without a sophisticated backup in advance, those data can be easily damaged or lost due to system crash, software conflict, virus attack or human errors. In order to hire double insurance for your important files, you are advised to backup them up regularly. You can set up schedule backup or manually backup those files at any time. It’s obvious that no one would enjoy the tedious process of taking backup, but the pain of losing precious family pictures, sensitive files and favorite music still can be very annoying. You could not afford to lose those valuable files because most of them are irreplaceable. Actually, the main function of File Backup is to strengthen the data security, this feature can recover the backed up image file safely no matter the file is lost due to any reason. Everyone would have his own backup preference. Which files and folders should be chosen to backup is dependent on the user’s specific needs. Here we listed some of the frequent objects; they are described here for informational purposes only. Documents: You should backup your documents which include your current work contents. And maybe also the temporary folders that are put on the desktop. Music: If you don’t want to disappoint yourself, backup your MP3 downloads which you’ve paid lots of money for. Because you’ll probably be depressed to lose them. Pictures and Videos: Family pictures and videos are priceless wealth, they are the witness which tell how time taken part in your life. It will not take too much time to backup it up, remind yourself to backup them regularly if you can. How to Do File Backup? Step 1: Download the freeware: AOMEI Backupper, install and launch it. Then, click "File Backup" under the "Backup" tab. Step 2: Click Add File or Add Folder according to your needs. Let’s take Add Folder for an example. Step 3: You will get the following screenshot as soon as you click Add Folder. Simply click the “Browse” to continue. Step 4: Choose the folder which you want to backup. As you can see from the screenshot, I choose the “pictures” to backup. Click “Open” to go to next step. Step 5: Click “OK” to confirm adding this folder. 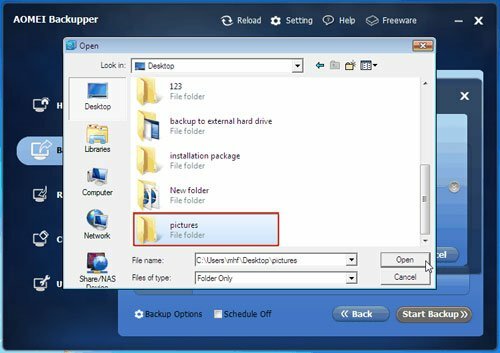 If you want to view the files in the backup image, you can use the Image Explorer function under Utilities to mount the backup as a virtual drive, so you can open the files in the backip in Windows File Explorer. You are not advised to backup your files to system partition which operating system is installed on. 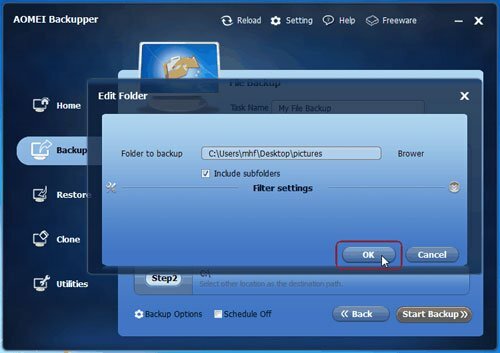 You could set some advanced options for the current backup task, please learn Backup Options, Schedule Backup and Backup Scheme.